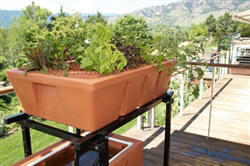 Year-round, organic, low stress aquaponics gardening is finally here. AB Aquaponics System is the world’s first organic gardening system that has been designed to grow plants and fish, year-round, both indoors and out. AB Aquaponics System is a highly productive aquaponics system that grows a nearly boundless variety of plants using organic nutrients supplied by fish growing in an attractive adjoining tank. 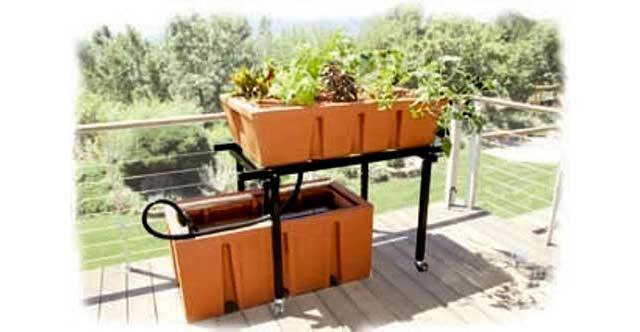 Imagine, waist-high container gardening without weeds or back strain that automatically waters and fertilizes itself and takes only minutes a day. All while using a fraction of the water of a dirt-based gardening system. Lip at 1.5" below the top rim to indicate the "dry zone"
Extra thick 1/4" food safe, UV protected PE plastic designed to never bow under the heat and weight of outdoor aquaponic gardening. 19" deep, 43" long by 22" wide, supporting approximately 60 gallons of water. Includes a 400 gallon per hour, 45 watt pump. Includes black, furniture grade PVC plumbing and fittings, with aeration holes for extra oxygenation in the fish tank. Includes 3/4" flexible vinyl black tubing to connect to the grow bed fittings with extra length so the tank can either be directly under the bed or not. Why the AB Aquaponics System? Rotational molded 1/4" thick, UV-protected, food-safe PE plastic – will not bow with heat and weight. 1 1/2”, 14-gauge, powder-coated square steel tubing. Black, furniture-grade PVC won’t break down in outdoor heat. No width greater than 28”– fits through all exterior doorways. Table designed to accept optional, matching Hanging Bar (+$200) for grow lights and trellising tall plants. 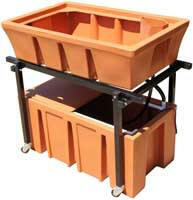 Handles and castors on the table, and handles on the fish tank and grow bed for easy for lifting and transporting. 4 Colors – Light Grey, Terracotta, Charcoal Granite and Stone. Furniture grade, high-gloss black piping (no PVC print). 1.5", 14 gauge powder coated black square steel tubing. Partially welded, the rest is easily assembled with heavy duty bolts and lock-nuts (included). Includes handles and 4 heavy duty casters for easy moving. 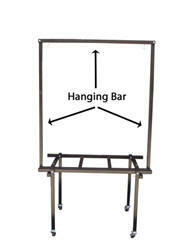 Accepts optional Hanging Bar accessory (+$200) for hanging grow lights and trellising tall plants. » 1.5", 14 gauge powder coated black square steel tubing. » Partially welded, the rest is easily assembled with heavy duty bolts and lock-nuts (included). » 33" high, 50" long, and 34" wide. » Includes handles and 4 heavy duty casters for easy moving. 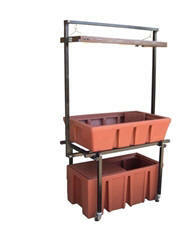 » Accepts optional Hanging Bar accessory (+$200) for hanging grow lights and trellising tall plants.